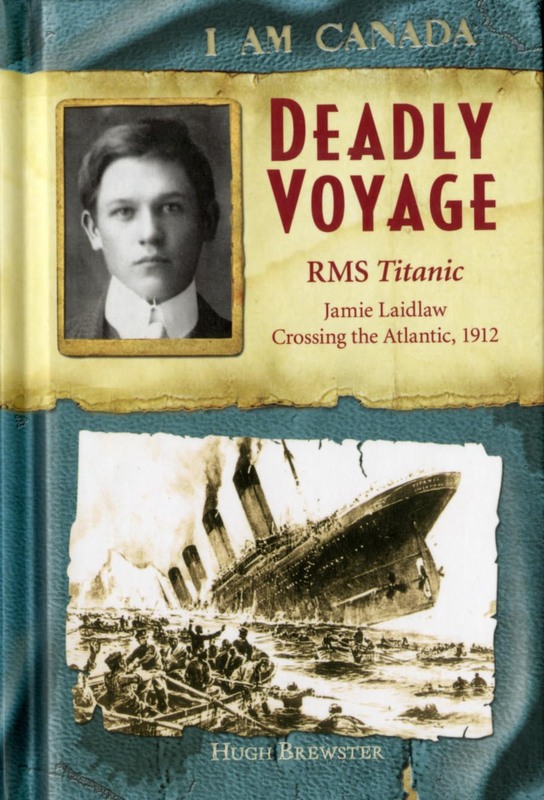 I have been wanting to read this book in the I Am Canada series, because it explores a time or event in Canada's history—this one being how a Canadian boy survived the Titanic sinking during his voyage home to Montreal (my city!) with his parents from London where he had attended Winchester College boarding school. I thoroughly enjoyed this recounting through the eyes of Jamie Laidlaw, a 14 year-old fictional character. It's a story that made me smile and of course, tear up, as I read about that tragic night. I had a lump in my throat through several scenes. Although Jamie and his family are fictional, the rest of the characters are not. Author Hugh Brewster, who previously worked on books about the Titanic history--even working with the explorer who discovered the Titanic, Dr. Robert Ballard--has tried to describe these real people and their experiences in relation to the Titanic as accurately as possible. There were several things I liked about this book, among them reading the perspective of a boy who saw his mother get into a lifeboat but had to stay behind with his father because men and boys were not permitted. I automatically thought of my son and my husband. Would I have had the courage to leave them behind? What a horrible situation. Jamie was such a likable teen, and his honest view of what was happening was insightful to read. Because he was a Montrealer, there were several references to my city and to famous historical people from Montreal who died on the Titanic, such as Mr. Molson and Charles Hays. Once again, as in the previous I Am Canada book I read, Blood and Iron, I found the themes in this novel to be universal: friendships, losing a parent, not wanting to be treated as a child, sibling rivalry, and dealing with feelings of being on the brink of manhood. I think all Canadian schools should include this series in their libraries. It brings history alive for middle-graders with stories that are coming-of-age, full of adventure, and poignant. Highly recommended.